Avalokiteśvara (/ˌʌvəloʊkɪˈteɪʃvərə/ UV-əl-oh-kih-TAY-shvər-ə; Sanskrit: अवलोकितेश्वर) is a bodhisattva who embodies the compassion of all Buddhas. 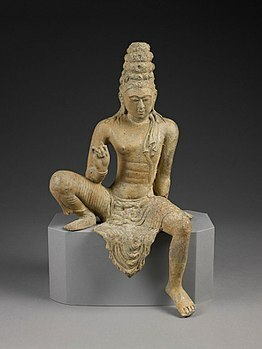 This bodhisattva is variably depicted, described and is portrayed in different cultures as either female or male. In Chinese Buddhism, Avalokiteśvara has become the somewhat different female figure Guanyin. 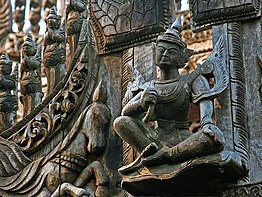 In Cambodia, he appears as Lokesvarak, and in Japan he is called Kanzeon or Kannon. The name Avalokiteśvara combines the verbal prefix ava "down", lokita, a past participle of the verb lok "to notice, behold, observe", here used in an active sense; and finally īśvara, "lord", "ruler", "sovereign" or "master". In accordance with sandhi (Sanskrit rules of sound combination), a+iśvara becomes eśvara. Combined, the parts mean "lord who gazes down (at the world)". The word loka ("world") is absent from the name, but the phrase is implied. It does appear in the Cambodian form of the name, Lokesvarak. When the Chinese monk Faxian traveled to Mathura in India around 400 CE, he wrote about monks presenting offerings to Avalokiteśvara. When Xuanzang traveled to India in the 7th century, he provided eyewitness accounts of Avalokiteśvara statues being venerated by devotees of all walks of life, from kings, to monks, to laypeople. 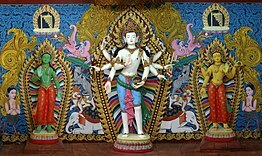 Avalokiteśvara is worshipped as Nātha in Sri Lanka. Tamil Buddhist tradition developed in Chola literature, such as in Buddamitra's Virasoliyam , states that the Vedic sage Agastya learnt Tamil from the Bodhisattva Avalokitesvara; the earlier Chinese traveler Xuanzang recorded the existence of a temple dedicated to Avalokitesvara in the South Indian hill Potalaka, a Sanskritzation of the Pothigai hill where Tamil Hindu tradition places Agastya having learnt the Tamil language from the deity Siva. Avalokitesvara worship gained popularity with the growth of the Abhayagiri Vihara's Tamraparniyan Mahayana sect. In Tibetan Buddhism, Tara came into existence from a single tear shed by Avalokiteśvara. When the tear fell to the ground it created a lake, and a lotus opening in the lake revealed Tara. In another version of this story, Tara emerges from the heart of Avalokiteśvara. 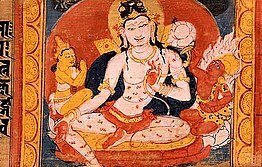 In either version, it is Avalokiteśvara's outpouring of compassion which manifests Tara as a being. ↑ "Avalokitesvara". Random House Webster's Unabridged Dictionary. ↑ 2.0 2.1 Leighton, Taigen Dan (1998). Bodhisattva Archetypes: Classic Buddhist Guides to Awakening and Their Modern Expression. New York: Penguin Arkana. pp. 158–205. ISBN 0140195564. OCLC 37211178. ↑ Lokesh Chandra (1984). "The Origin of Avalokitesvara" (PDF). Indologica Taurinensia. International Association of Sanskrit Studies. XIII (1985-1986): 189–190. Archived from the original (PDF) on June 6, 2014. Retrieved 26 July 2014. ↑ 7.0 7.1 Studholme p. 52-57. ↑ Lopez 2013, p. 204. ↑ Läänemets, Märt (2006). 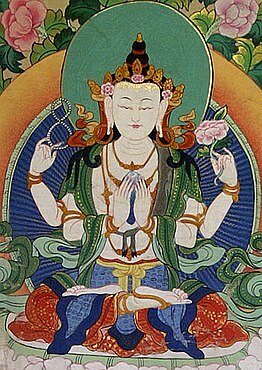 "Bodhisattva Avalokiteśvara in the Gandavyuha Sutra". Chung-Hwa Buddhist Studies 10, 295-339. Retrieved 2009-09-12. ↑ Bao Ern Temple, Pingwu, Sichuan Province Archived 2012-10-15 at the Wayback Machine. 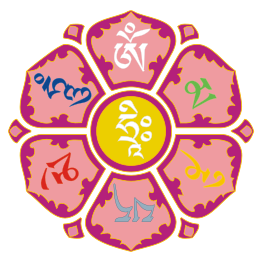 This article includes content from Avalokitesvara on Wikipedia (view authors). License under CC BY-SA 3.0.